Giving to Alpha Phi Foundation is a personal commitment a donor makes, choosing to invest in the future of our sisterhood and the overall advancement of women’s lives. Alpha Phi Foundation holds each of our donors in the highest regard and has established multiple opportunities to allow individuals to determine how they would like to give. Giving online is quick, easy and secure. Make your online gift today! To make a donation by mail, please send a check or money order to Alpha Phi Foundation at 1930 Sherman Avenue, Evanston, IL 60201. If you are a chapter officer or advisor sending in event donation, please download the Donation Cover Sheet to accompany your event proceeds. Call 847.475.4532 and a staff member will be delighted to assist you. As a donor to Alpha Phi Foundation, you may be able to double or even triple the impact of your outright gifts if your employer or your spouse’s employer offers a matching gift program. Such programs typically match all or a percentage of employee contributions to charitable organizations, making the employer a partner in your personal philanthropy. In most cases, all you need to do is obtain a matching gift form from the personnel department, fill it out, and include it with your gift to the Foundation. We will do the rest. If you have any questions, please contact Alpha Phi Foundation or your employer. One of the most powerful ways to give back to Alpha Phi isn’t necessarily in monetary form. Non-cash gifts can take many forms, including gifts of securities, non-traditional investments, real estate, and tangible personal property. If you’re interested in learning more about non-cash gifts, please contact Crista Vasina, Senior Director of Development. The Foundation accepts gifts of tangible personal property, including works of art, jewelry, antiques, coin, stamp and other collections, automobiles, manuscripts and books. An essential issue for donors to consider before contributing a gift of tangible personal property is whether they would like the Foundation to use or display the property. Prospective donors should be advised that the Foundation reserves the right to sell or otherwise dispose of the personal property in question, if such action is financially advisable or necessary. Whenever donors estimate their gifts of tangible personal property at $5,000 or more, they must obtain a written appraisal by a qualified independent appraiser. The Foundation cannot appraise or assign valuation to gifts of tangible property. Such gifts must be accepted by the Executive Director in consultation with legal counsel. 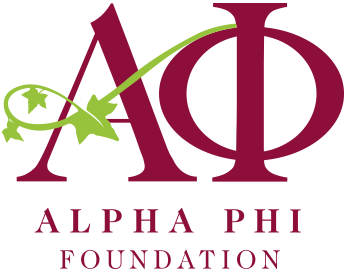 It is the general policy of Alpha Phi Foundation to accept planned charitable gifts for the benefit of the Foundation as provided by the Internal Revenue Code. In accordance with this policy, all gifts, including those designated, restricted or unrestricted, shall be accepted or rejected by recommendation of the Executive Director, subject to the ultimate approval or disapproval of the Board of Directors. The Foundation seeks the advice of legal counsel in all matters pertaining to its planned giving program and executes no planned giving agreement without the advice of counsel. All agreements shall follow the format of the specimen agreements provided or approved by the Foundation’s legal counsel. Prospective donors are urged to seek their own counsel in matters relating to their planned gifts, tax and estate planning. Those remembering the Foundation through planned gifts become members of the Clara Bradley Burdette Society, which recognizes members in their lifetimes with a special silver and Bordeaux pin and other recognition. For more information, please see our planned giving website. An easy and convenient monthly recurring gift is a wonderful way to support Alpha Phi Foundation’s vital programs. Start your recurring gift today! Spreading out your payments on a large gift through a pledge—a formal agreement to make a gift to the Foundation—is a wonderful way to reach a more generous goal with regular payments over time. What is more, each payment on your pledge is eligible for an income-tax charitable deduction. Like all gifts, pledges can be designate to a specific fund or program. Alpha Phi Foundation also endowment gifts. Unlike gifts for current use, endowment gifts provide security over the long term by expanding the Foundation’s permanent financial base and creating a predictable source of future income for such things as endowed scholarships. For pledged gifts and endowment gifts, please contact Crista Vasina, Sr. Director of Development. Are my gifts to Alpha Phi Foundation tax deductible? Yes. Alpha Phi Foundation is recognized by the IRS as a 501(c)(3) charitable organization, which means that all gifts to the Foundation are tax-exempt to the fullest extent allowed by law. Our federal tax identification number is 36-3895478. Can I write a check to Alpha Phi Foundation? Yes. Please make your check payable to Alpha Phi Foundation. We are unable to process checks written to other organizations. If you would like to designate your gift to a specific fund or program, or if you are giving on behalf of an Alpha Phi chapter, please make note in the memo field. Is your online donation page safe and secure? Alpha Phi Foundation’s online donation form is operated by Blackbaud Merchant Services, a respected industry leader in online donations. When you enter your credit or debit card information onto our secure (SSL) website your information is encrypted and is unreadable to anyone outside the transaction process. What are the Foundation’s administrative costs? All not-for-profits have administrative expenses. Alpha Phi Foundation works to keep our administrative expenses as low as possible—around 20%. You can apply your donations to different Foundation funds and programs by marking your gifts as unrestricted or restricted. Unrestricted gifts are among the most valuable to the Foundation because they allow us to allocate the funds wherever the need is greatest. These gifts to the annual fund not only support the Foundation’s vital programs—unrivaled leadership training, scholarships, women’s heart health, Forget Me Not Grants, and heritage—but also fund the people, facilities and technology the Foundation needs to be able to administer our vital programs. Restricted gifts allow you to designate your gift to a specific program, grant, scholarship or endowment. When you designate your gift, you enjoy the satisfaction of knowing you are supporting a program that is personally meaningful to you.